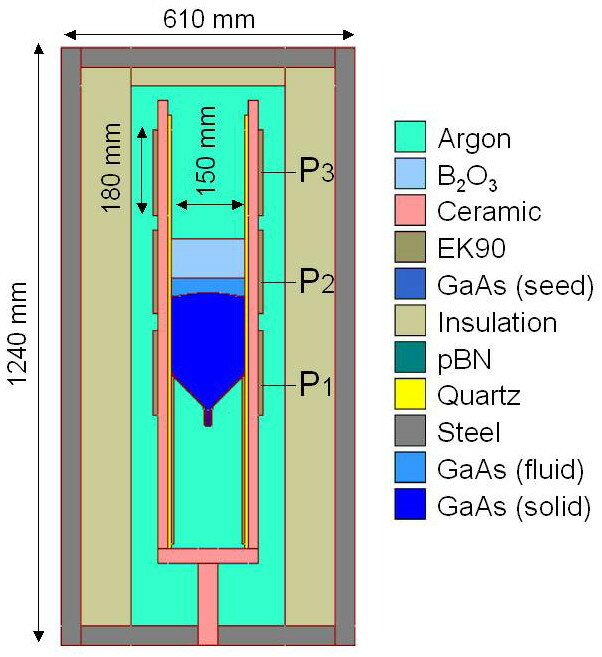 The Bridgman technique is widely applied to grow high quality III-V semiconductors such as GaAs, InP, etc. The vertical gradient freeze method (VGF) is a modification of the conventional Bridgman method without moving the ampoule or heaters. In this case, the crystallization process is provided by changing the heat supply in the electrodynamic gradient multi-zone furnace. Optimization of heat transfer in the furnace, and the melt and gas flows is the key point in growing quality crystals. latent heat release on the crystallization front. Optimization of process recipe is a powerful approach to increase yield and to improve crystal quality. In the presented example, optimization of the process has been performed without any hardware modifications. 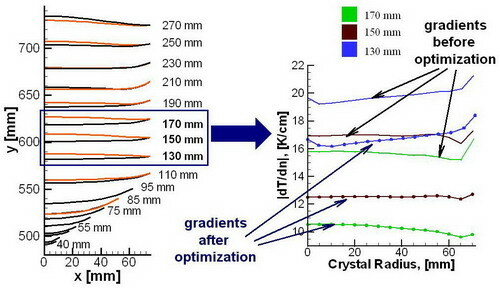 Optimized recipe allowed us to achieve more convex melt/crystal interface shape in the beginning of cylindrical part of the crystal and significantly reduce probability of multi-crystalline material growth. 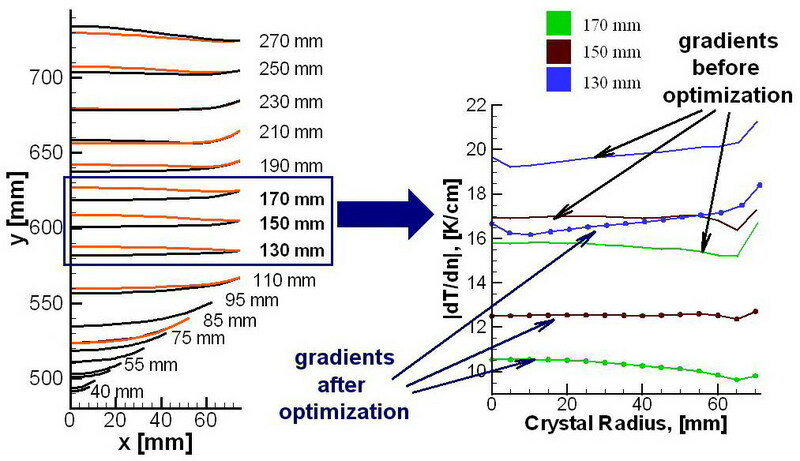 Lower values of temperature gradients reduce dislocation density in the crystal and reduce probability of crystal cracking in the end of the process caused by residual stresses. Original operating regime of the heater and computed temperature distribution in the reactor are shown in Figure 2. Figure 2 (b). 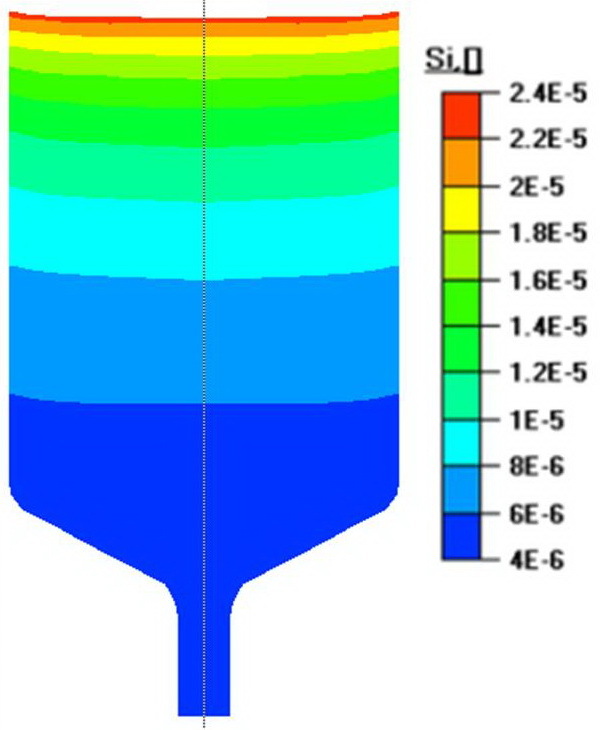 Computed temperature field in the reactor. For each of the three heaters, we suggested individual dependence of the power as a function of time. 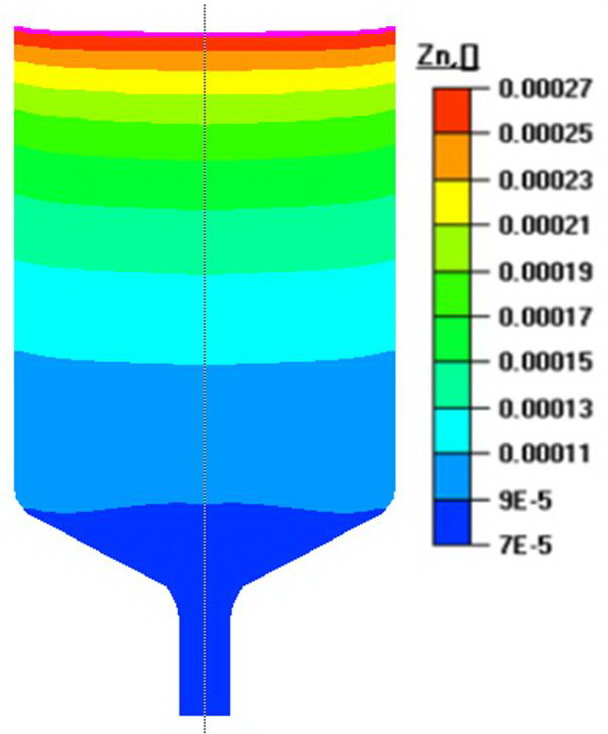 Optimized heater power evolution and the resulting temperature distribution in the reactor are shown in Figure 3. Figure 3 (b). Computed temperature field in the reactor after optimization. Effect of the heater power optimization is illustrated in Figure 4. 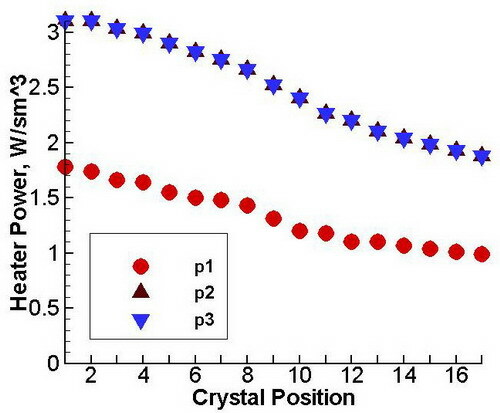 One can see a noticeable effect on the shape of the crystallization front, as well as significant drop in temperature gradients at the melt-crystal interface, which allows us to hope for a considerable improvement of the crystal quality. Figure 4. Effect of the heater power optimization. 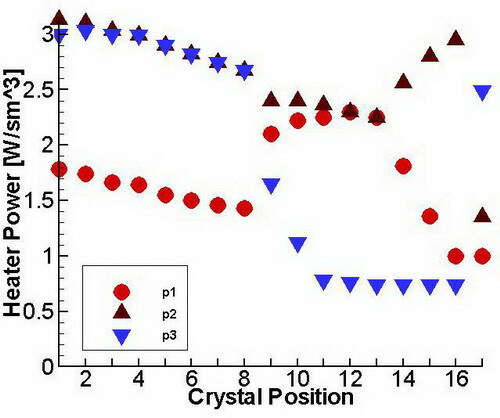 Evolution of the crystallization front before (black) and after the optimization (red). The correlation between the crystallization front shape and the temperature gradients along the front. design of the side and upper insulations. GaAs crystals are doped with different elements to achieve the required electric conductivity for semi-conducting or semi-insulating wafers. Control of segregation of doping materials is important to increase a high yield of GaAs wafers with electric conductivity values within the specification limits. Modeling of melt flow coupled with segregation helps to obtain distribution of dopant, for example Si or Zn in the crystal.